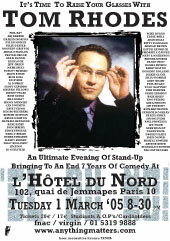 Tom was that last comedian to perform at the Hotel du Nord back in March 2005. 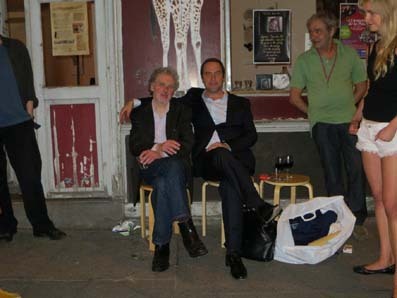 It was quite a night and he even got a live CD out of the show. 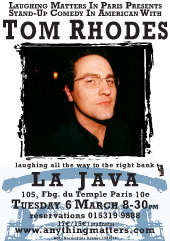 and this will be his first appearance at La Java and his fifth in Paris. 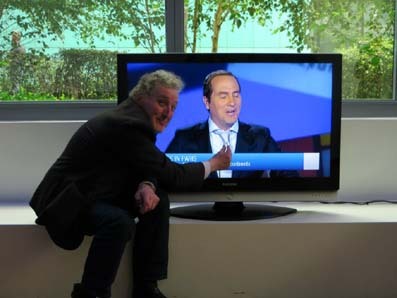 Watch a brief extract from his 2005 slot at the HdN by clicking below. 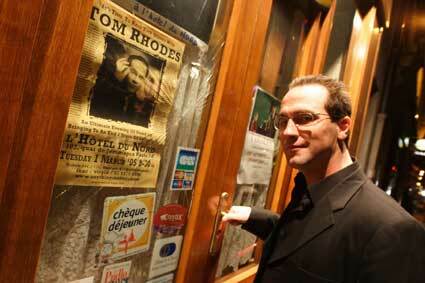 The life of Tom Rhodes began anew the night he stood alone in front a large crowd and created laughter. Since that night in Florida at the age of seventeen, Tom has been willfully following his bliss. Its the solemn duty of those who receive that rare, beautiful, it was his obligation to do something momentous in their lives, or at least die trying. And now television was beginning to catch on to his unique style. Toms many TV appearances in the early nineties (Evening at the Improv, MTVs Half Hour Comedy Hour, Comic Strip Live) were helping to make him a popular club attraction. However, his first significant break came when a new 24 hour, all comedy cable network calling themselves Comedy Central, signed Tom to its first ever talent development contract. They began airing thirty-second spots of Tom expounding on a range of subjects from war and authoritarianism to the state of the economy and the defects of human behavior. It was a perfect outlet for the rising talent to share his twisted perceptions with greater audience. These image campaigns were already doing wonders for Toms popularity, but the apex of his affair with Comedy Central came with the critically acclaimed Viva Vietnam: A white trash adventure tour. This hour-long special followed Tom on a hilarious and sometimes emotional journey through the once war torn country where his father had served as a helicopter pilot. In the summer of 1995 Tom was invited to appear at the Montreal Comedy Festival. It was there that he caught the attention of an N.B.C. talent scout. The Mr. Rhodes show aired on the N.B.C. network in the fall season of 1996 and 97. In the starring role Tom played a revolutionary schoolteacher bent on inspiring his pupils with ides of free thought and rebellion at an uptight prep school. Once his acting contract had expired Tom moved east again, this time to New York, where he promptly returned to the arms of his first love of stand-up. During this time he made several more television appearances on Later with Craig Kilborn, The Tonight Show with Jay Leno and Politically Incorrect while resuming his global assault on comedy audiences. 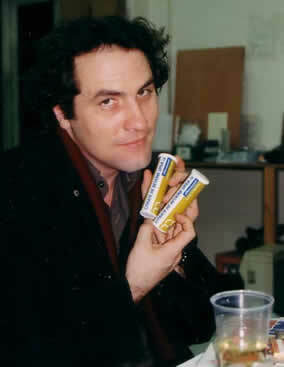 Toms first film project titled Living the Funny is due for completion in early 2000. 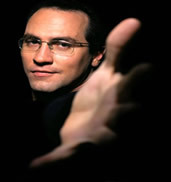 The film is the combined effort of Tom and San Francisco independent filmmaker Gary Smithson to document the evolution of Tom as a stand-up comedian. Its an insightful look at Toms ongoing and unconventional odyssey into the world of show business. The film is already an underground hit in the Bay area and will be premiering at film festivals world wide throughout the year. At times Toms journey is like a manic game of international hopscotch; the endless web of show dates might find him on a redeye across the Atlantic or in the honky-tonks of Georgia without discrepancy. Thats fine by Tom, for every stage he steps onto, either grandiose or makeshift, is an opportunity to take a group of strangers on the ride of his life. The subsequent thrill of that ride is the result of a life dedicated to the riches of experience, the power of knowledge and the willingness to live a thousand lives and die as many deaths. 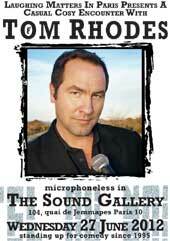 These are the chores of the modern day comedian, and why Tom Rhodes is one of the best. How can you not love Paris? Paris has always been about overindulgence and what are we here for if not for pleasure? Human beings are instruments built for joy. Being sad or depressed actually goes against our very function and why we are here. This past December was the last time I was in Paris just a few weeks before the Millenium celebration. I had been out boozing it up with some Parisian friends of mine and at 3 o'clock in the morning instead of going home I directed the taxi driver to take us to the Eiffel tower and leave the meter running when we got there. On a previous trip I had been to the top but I just couldn't resist visiting that old girl again. With the taxi meter running I went out underneath the Eiffel tower and spread out comfortable on my back looking upwards into the interior of that monument of love with my heart lined up where I thought the top point of it's antennae would be. Looking up from under the Eiffel tower at 3 in the morning is where Nirvanna is found. The tranquility of it all and the absolute silence that penetrates all memory of earthly chatter, peace is what your brain will find there, the only sounds you will find is the singing of the multitude of birds living on it's insides. From the bottom looking up the Eiffel tower looks like a rocket ship about to blast off and that symphony of birds chirping it's heavenly melody is one of the sweetest sounds my pea brain has yet to record in my life on this planet. I enjoyed it undisturbed for 20 minutes even after I had given up on trying to persuade my friends to stop being so French and give it a try. Of course they didn't, they sat in the cab broading over cigareetes and being French. On the wat home they remarked how crazy I was and above all how much of a waste of money it was. The whole round trip affair with tip cost about 40 U.S. dollars and by far it was the best 40 U.S. dollars I ever spent. Everyone has style in Paris, even the poor Garbage men wear snappy uniforms and the Firemen have pants that would be killing it in any of the late night clubs of New York. To me, coming here feels like you are visiting your favorite relative. Everywhere you look in Paris there are dramatic statues and the honoring of womanhood is the primary theme of most of them. Some of them have been so finely executed that they have the power to seduce and make you surrender to the urge to place your head in their laps and sleep in their warm tenderness. Most of my time has been spent in the Bastille area where you may recall was the catalyst of the French revolution and the scenes of it's bloodiest episodes. There are still rectangular foundation blocks in many of the Bastille area's intersections from where the Guilletine's were set up...That's a nice reminder for the Politicians; "We didn't like this one group of leaders we had and we cut off all of their heads" Don't let us down. I saw a teenage girl at the D'Orsey museum wearing a t-shirt that said: "Kill God, Kill your Parents, Kill Yourself" Obviously she didn't mean it because she was at a museum supporting truth & beauty. My first serious adult love story was with a girl named Nathalie who was from Paris, we lived together in San Francisco for 6 years. Her Mother who I'm still close with and still lives in Paris would always say "The best thing America ever gave the world was Elvis Presely and chewing gum" In France they have a popular chewing gum and it's brand name is "Hollywood chewing gum" This gum usually makes me angry because I think to give yourself a name like "Hollywood" you've got a lot to live up to and this gum looses it's flavor in less than 3 minutes. It finally dawned on me that it should loose it's flavor after only 3 minutes because that's exactly how long tastes last in Hollywood. As an American the best sentence to know in French is: "je sois des ole" Which means: "I'm sorry" I was jumping around on the statue gravestones of Par Lachaise cemetary when these two little old ladies came up scolding me in French, you should have seen them fold and start to blush when I sheepishly said "Je sois des ole" to them, it also helps that being an American is like having a passport to idiotic behavior, if you are an American Europeans almost expect you to be an ill mannered monkey and I guess I didn't do too much to have anyone percieve otherwise. I went to see Jim Morrison's grave but I was disappointed to find a bunch of stoned losers there, I had pictured being the only stoned loser there, I had pictured having my moment with Jim. But only a few hundred feet away is Oscar Wilde's grave and he was far more memorable and poetic than Jim and noone was hanging out with Oscar so I hung out with Oscar. I read a book of famous quotations not too long ago and the best quotes were from Oscar; for example: "We are all lying in the gutter, some of us are looking at the stars" Even on his deathbed his last words were: "Either that wallpaper goes or I do" Come on, were those really his last words? That's almost a little too clever, maybe his last words were something more like: "Get the doctor quick! Gurggle gurggle puff ahhh..." But that wouldn't look cool in a quote book. I would like to be a lot more like Oscar Wilde, but without all of that pesky cocksucking of course. I drank Absinthe for the first time this trip to Paris, my friends had a few bottles and it just recently became legal again after being prohibited in Europe for the past 100 years. It's what all the great artists and poets like Verlaine,Rimbaud and Baudelaire used to drink and it was rumored to have driven a few people crazy which is why it was originally taken off the market which was precisely the reason why I was so anxious to try it. We even found the Absinthe spoons of those old days for sale at a flea market along the Seine and we melted sugar cubes into it's flourescent green shade as was the appropriate custom. It has the feeling of a narcotic rather than that of liqour and it made me transform into a wolf as I was stepping with delight in the nightime air, it did not produce in me the urge to go home and write the world's greatest poem, however it did give me the desire to dig up Oscar Wilde's corpse and blow him. I once saw a film with Jean Paul Belmondo and in it he said these tantalizing words: "We are made of dreams and dreams are made of us, so what is the point of figuring it out?" The first time I ever came to Paris there was a night I had gone out by myself and was jumped by two street thugs and they maced me right in my eyeballs. I consider it an honor to have been maced in the city of love, that sounds like the perfect country song 'Maced in the City of Love'. I have now been to Paris a handful of times and I still don't know anymore about love then I ever did, I still look at love like a romantic 14 year old girl, I'm still dreamy and optimistic enough to believe all of those fairy tales we were told and that each of us has one true soul mate out there that was meant for us. I don't ever want to not look at it like a romantic 14 year old girl, life is so much more enjoyable that way and life is about protecting your innocence and protecting innocence in general.